← PRACTICING SHAMANISM: WHAT DOES IT MEAN TO BE A SHAMAN? 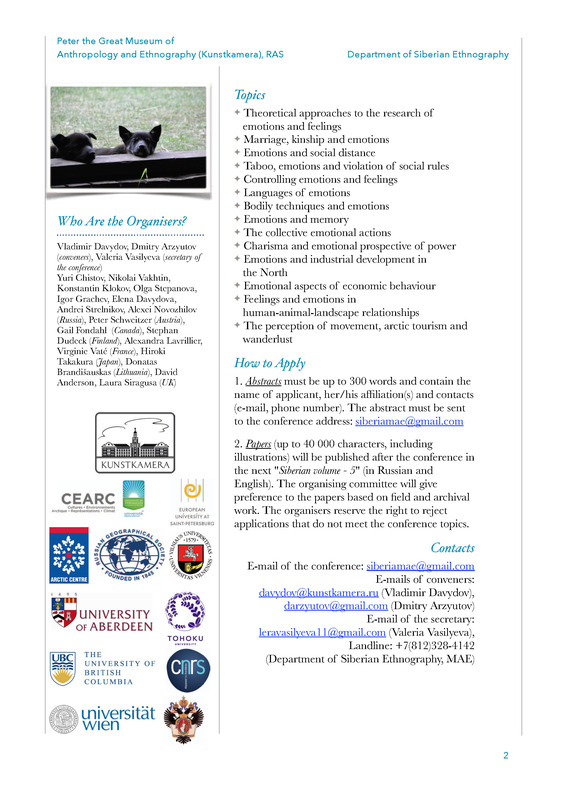 A really early announcement for a great conference on Arctic Anthropology! I hope to meet many of the readers of our blog in a years time in St. Petersburg in order to discuss an important theme in our field. As some of you might have guessed I would like to distract the participants’ attention a little bit from the dominance of “love” and “harmony” as emotions associated with the Russian North. Instead I would like to guide them into themes that have some theoretical implications for anthropology like practices and expressions of ‘attachment and detachment’, ‘performance and representation’ of emotional states, ‘techniques of ecstasy’, ‘irrationality’, ‘shame’, ‘effervescence’, ‘awe’, ‘affective control’ and ‘transgression’. 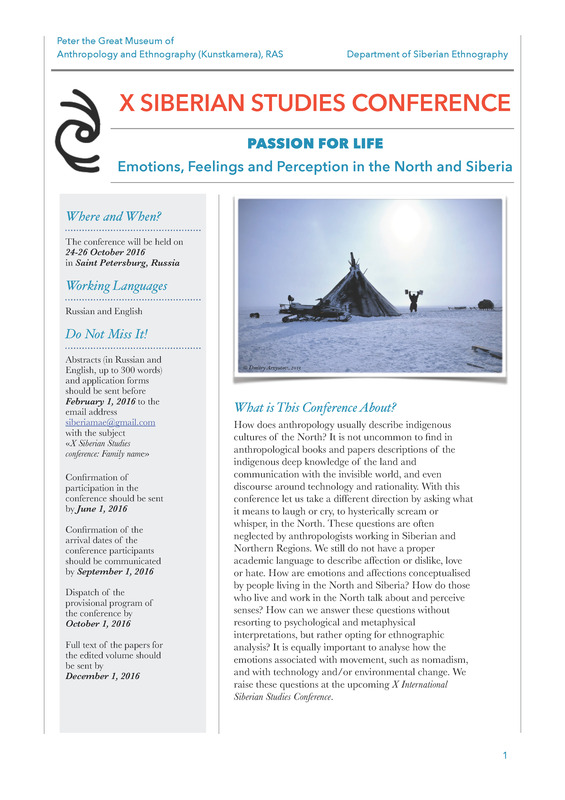 There seems to be two particular poles in the Siberian (better circumpolar) ethnographic material: on the one hand control and restrain of emotions (silence, calmness, equanimity) possibly associated with hunting, and on the other hand ritually performed excess of emotional expressions possibly associated with shamanic practices. I would prefer to put the focus on practices and body techniques as something particularly accessible by ethnography in contrast to psychology (though I would appreciate contributions from our colleagues ethnopsychologists at the conference very much). See you in St. Petersburg in October 2016! This entry was posted in All, Announcements, conferences, Russian North, Theoretical Issues and tagged Affections, Affects, Emotions, hate, love, Siberian Studies Conference, St Petersburg. Bookmark the permalink.